As we age, most people both expect and accept that they will not be able to do 100% of the things they could as young bucks. But sadly for many, loss of vision with age is an unwelcome and harsh reality. Age-related macular degeneration (AMD) is the most common cause of vision loss among aging adults and a frequent issue for people over 50. However, with new therapies and research, the tide could be turning for treating this disease. According to the National Eye Institute (NEI), AMD causes loss of vision by slowly deteriorating the macula, a very sensitive part of the retina found in the back of the eye. The macula’s function is to provide detailed straight-ahead vision and is made up of millions of light-sensing cells. When the macula is damaged, fine points are lost. For many with AMD, peripheral vision stays intact, but it might become difficult to drive a car, read or recognize faces as their central vision becomes degenerates. The disorder progresses differently in different people - sometimes it moves quickly and vision may be lost in one or both eyes, and sometimes it develops very slowly and patients continue with fairly normal sight for quite some time. The NEI reports that Caucasians are at greater risk for AMD than those of African descent, and that the likelihood of developing AMD increases with a family history of the disease. Smoking also seems to be a major factor, with some research showing as much as a two-fold increase in risk caused by the habit. The disease is divided into two categories with different symptoms, effects and treatments: dry AMD and wet AMD. Dry AMD (especially in the earlier stages of progression) is the most common type. According to the NEI, 90 percent of people with AMD have dry AMD. In this form, the central vision is slowly blurred as light-sensitive macula cells are broken down over time. Dry AMD often causes no initial vision loss in patients, which proves to be both a blessing and a curse. Since vision may continue as normal, early signs of the disorder can be hard to detect. Because of this, it is important to regularly have your eyes examined to watch for the disease. By the time vision begins to be blurred or dulled, the macular degeneration has already begun to occur. As vision does blur, patients might notice they are requiring more light to complete everyday tasks and find it newly difficult to recognize faces. If this occurs, it is time to pay a visit to an eye care doctor. One potential symptom of the disorder is drusen, which are yellow or white deposits under the retina. These can be seen during an eye examination and while they do not usually cause vision loss on their own, the NEI reports that people with drusen have a greater risk of developing more advanced AMD. Dry AMD can affect people in various ways. Some might have the disease only in one eye, and not suffer from changes in overall vision. These patients can often still drive, read and see clearly without issue. 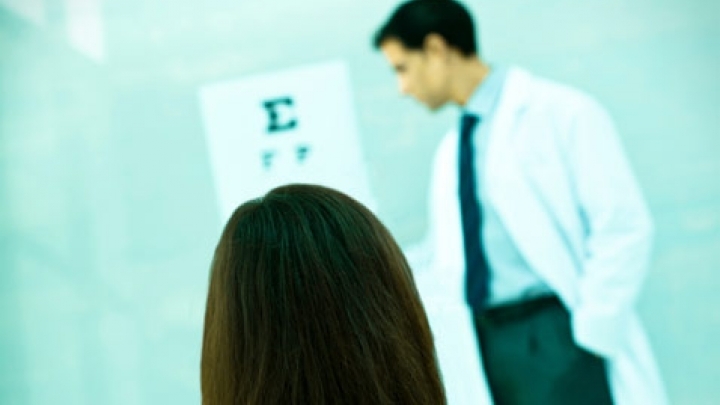 There is no current treatment for early stage dry AMD, but doctors monitor patients closely to watch for signs of progression. If the dry AMD occurs in both eyes, it can cause more serious vision loss and, over time, a larger and larger portion of straight-ahead vision can become blurred. The disease can also advance if it turns into wet AMD. As the disease progresses, some doctors might prescribe supplements as a potential (but unconfirmed) method of slowing the degeneration. When macular degeneration progresses to wet AMD, an advanced form of the disease, vision loss can occur with greater speed and severity. In wet AMD, new, abnormal blood vessels begin to develop behind the retina and grow beneath the macula. They can start to leak fluid and blood, leading to swelling of the macula and quicker deterioration. The NEI estimates that around 10 percent of AMD sufferers have this type of the disorder. Though it can develop quickly, it can also be treated effectively if detected early. If straight lines begin to appear wavy or a blind spot occurs, it is once again time to visit an eye care doctor immediately. There are several treatment options that are effective for slowing or stopping the progression of the disease in some patients. The NEI reports that when wet AMD occurs, high levels of vascular endothelial growth factor (VEGF), a material that encourages the growth of the abnormal blood vessels at the root of wet AMD, are leaked into the eyes. Injections of anti-VEGF drugs into the eyes can counteract these leaks and hopefully slow macular deterioration. Another treatment option for wet AMD is photodynamic therapy, in which the patient is injected with a drug called verteporfin that interacts with blood vessels. The doctor will then use a laser beam to activate the verteporfin in the abnormal blood vessels in the eye, destroying them and hopefully slowing the disease. Though less common, some patients and doctors also opt for a more direct laser surgery to treat wet AMD. During this therapy, lasers are used to destroy the new blood vessels, but these lasers can inadvertently destroy surrounding eye tissue, making it a riskier treatment option. As the population ages and age-related macular degeneration becomes more and more prevalent, the demand for better treatments and new research will grow. A recent clinical trial from the NEI and the University of Wisconsin-Madison has provided more evidence for a case being made that cancer drugs Avastin (bevacizumab) and Lucentis (ranibizumab) are effective AMD treatments. The drugs were originally created to stop the growth of blood vessels that enabled the spread of tumors in cancer patients and are now being aimed at the abnormal blood vessel development that occurs in AMD. In this most recent study, as-needed therapy with the drugs (in the form of eye injections) showed effectiveness in treating AMD. Research will continue, but cancer drugs could prove to be a groundbreaking treatment for AMD sufferers. National Eye Institute, "Facts About Age-Related Macular Degeneration" "Clinical Trial: More Evidence that Cancer Drug Treats Macular Degeneration"